ZeniMax has disabled guild banks in The Elder Scrolls Online because of a dupe bug that's breaking the in-game economy. Update: ZeniMax has issued a statement saying the dupe bug has been fixed. "Yesterday, we identified an item duping bug in ESO that some players chose to exploit," a rep said. "We acted quickly, and have since fixed the issue. We have a zero tolerance policy when it comes to abusing exploitable bugs, and those who were found doing so will have their game account permanently banned." There is still no word on when guild banks will be restored. Original story: A dupe bug, for those unfamiliar with the term, allows players of online games to duplicate in-game items at will, which they can then sell to vendors for effectively unlimited money. As you might imagine, that throws game economies completely out of whack, which is why developers tend to move rather aggressively to stamp them out. 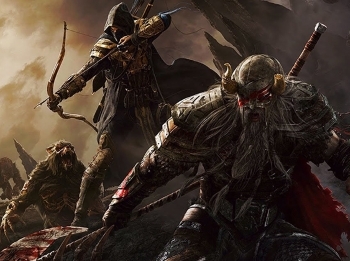 One such bug has struck The Elder Scrolls Online, which a Reddit user described as "so simple... that it is possible to do it by pure accident." According to the post, the bug has been known among players for more than a week, and the situation has grown so bad that a full recovery may require "something drastic." "Players in full legendary gear, billions of gold (From duping mats and selling them to vendors over and over), and so much more. Money, items, etc is completely worthless," Reddit user Mistress-Rarity wrote. "People are completely panicking that Zenimax will have to drop a nuke, but nobody knows what they can do to fix the problem." ZeniMax posted a notice in The Elder Scrolls Online forums early this morning that "Guild bank functionality has been temporarily disabled on the North American and European megaservers," but said nothing about why it was pulled. The l.04 patch released yesterday reportedly addresses the issue to some extent by forcing players to stack items in inventory before placing them in guild banks, but some users have suggested that it covers up the bug rather than fixing it, and how ZeniMax will address the economic damage already done remains unclear.